Most individuals will require extraction of their wisdom teeth at some point during their lives. These extra sets of back teeth may never come through the gums, or they may erupt through the gums at an irregular angle. In either case, the wisdom teeth can become stuck (impacted), ultimately causing an array of problems, including severe pain and issues that can affect your oral health and the condition of your other teeth. Many general dentists do not offer advanced treatment for wisdom teeth extraction. Fortunately, this procedure is a strong focus of our practice, and our experienced oral surgeons—Dr. Michael W. Golding and Dr. J. Gregory Sabol—offer effective treatment designed to successfully remove wisdom teeth in the most efficient, comfortable way possible. If you or your child is in need of wisdom teeth removal to reduce current symptoms or to prevent the complications that can arise from wisdom teeth later in life, our doctors at Oral & Facial Surgeons of Arizona can help. Wisdom teeth are additional molars (back teeth) that often do not develop until one reaches their late teens or twenties. 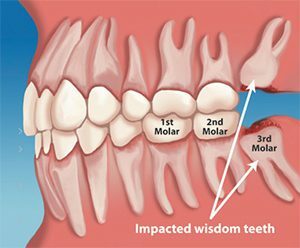 The reason they took on the name “wisdom” teeth is because the acquiring of wisdom is often associated with maturity, and wisdom teeth come with age. These extra molars are ultimately not necessary for effective chewing, and they often simply do not have room inside the mouth to grow properly. In many cases, wisdom teeth that are left inside the mouth can create substantial oral health problems; therefore, it is often “wise” to have wisdom teeth removed! Some patients may not be experiencing active symptoms; however, wisdom teeth removal may be recommended as a preventative treatment in order to reduce the potential for problems that may arise in the future. When wisdom teeth become impacted, they can cause a number of detrimental symptoms, including severe pain, swelling in the gums or around the jaws, bleeding gums, bad breath, strange tastes when eating, and even headaches. With that in mind, some individuals who have impacted wisdom teeth experience no symptoms at all. 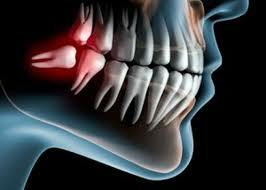 Wisdom teeth impaction can occur to varying degrees. Soft tissue impaction is present when the top portion of the tooth (the crown) has come through the bone but is fully or substantially covered by the gum. A partial bony impaction involves a wisdom tooth that has partially erupted, but is still primarily below the gum tissue and inside the jawbone. A full bony impaction is a tooth that has not erupted and is completely covered by the jawbone. Our surgeon will determine the type of wisdom teeth impaction you may be experiencing during the initial consultation and evaluation. If extraction is necessary, a customized treatment plan can be created to effectively remove the wisdom teeth. What Does the Wisdom Teeth Removal Procedure Involve? Wisdom teeth removal is one of the most commonly performed procedures at our practice. This is an outpatient treatment that typically does not require an overnight hospital stay. In addition to the safe and effective removal of the wisdom teeth, your comfort is a high priority for our team. While a local anesthetic is often all that’s necessary to minimize potential discomfort during this procedure, we offer a variety of anesthesia options – including general anesthesia and nitrous oxide – for patients who would like to ensure they feel as relaxed as possible. Once the wisdom teeth have been removed, a small number of sutures will often be necessary to seal the opening in the gums. These will be taken out in a follow-up appointment about one week after the procedure. Wisdom tooth extraction is typically a very simple treatment, and our team strives to make the process a quick, comfortable, and efficient one. Once your procedure is complete, we will provide you with aftercare instructions and a kit that includes antibiotics and, if necessary, a prescription for oral pain medicine. They were very kind and explained the process throughly when my daughter got her wisdom teeth removed both Dr.Sabol and the nurses helped very much. What Can I Expect During Recovery from Wisdom Teeth Extraction? The specific details of what to expect during the recovery process from wisdom teeth extraction will ultimately depend on the number of teeth being removed, your unique rate of healing, and how closely post-treatment instructions are followed. While there will likely be some temporary swelling and discomfort in the treatment areas, this can be managed with pain medication. You may be placed on a restricted diet for a few days after the procedure (typically a soft-food diet) to minimize the risk of harm to the extraction areas as they heal. In most cases, wisdom teeth extraction does not require extensive downtime following the procedure. Learn more about caring for the treated areas after wisdom teeth removal. How Much Does Wisdom Tooth Extraction Cost? The total cost of wisdom tooth extraction is based on a number of factors, including how many wisdom teeth are being extracted, the complexity of the procedure, the experience of the oral surgeon, and other components. If general anesthesia or other sedation dentistry techniques are utilized during the procedure, this will also have an effect on the overall price. The website Angie’s List cites general estimates of wisdom teeth extraction (using only a local anesthetic and no general anesthesia) as between $75 to $200 for one tooth, and between $300 to $800 for all wisdom teeth. It is important to note that this is a general national average price and may not be reflective of the price range here at our practice. When you meet with our oral surgeon and a customized treatment plan for wisdom tooth extraction is developed, a member of our team will calculate the total cost of treatment, including all potential expenses, and talk with you about our payment options. Many insurance companies offer at least partial coverage for wisdom tooth extraction, and we work with reputable agencies such as CareCredit® that offer convenient dental care financing options for qualified applicants. We are happy to answer any questions you may have about the variety of payment options available at our practice. For more information on wisdom teeth extraction for you or your child, or if you would like to schedule a consultation to talk more about this procedure, please contact Oral & Facial Surgeons of Arizona today.